Any book that combines psychology with Soviet history and the meaning of music was always going to catch my eye. My Russian grandmother came to England in 1918 when her family fled the revolution, so I have always had a fascination with this era of world history. But it is only recently, and thanks to my son’s GCSE studies, that I have learned about the complex relationship between Stalin’s ‘reign of terror’ and the compositions of 20th-century composer Dimitri Shostakovich. By all accounts he created works that had a powerful and lasting effect on those living under Stalin’s regime, and many have conjectured that his music carried coded political messages. 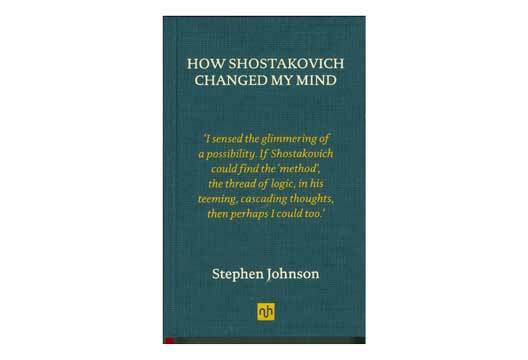 In this short book, Johnson’s musings centre around two personal stories – the challenges faced by Shostakovich during this turbulent period in which almost a third of the population starved to death; and the author’s own personal struggle with bipolar disorder. He weaves between vivid descriptions of the compositions and moving accounts of the climate in which they were both written and performed, pausing every now and again to explain the significant role that this music has played in his own troubled life. Johnson – a renowned classical music journalist and regular speaker at ‘The Musical Brain’ conferences – speaks passionately of the power of music to communicate, unite and heal. Despite being immersed in classical music for much of my life, I am relatively ignorant about much of what I listen to. I can thoroughly enjoy a piece of music but remain oblivious to what it is or why I like it (much like my experience of wine). And for me this book relied too heavily on having a good knowledge of Shostakovich’s compositions. As a music analyst, Johnson is inclined towards quite specific and detailed interpretations of the semantic content and communicative intent of the compositions he listens to. ‘Elegy’, he argues, is definitely about ‘us’ and ‘we’, and not about ‘I’. While I wholeheartedly agree that music has a phenomenal power to reflect and convey emotional states, I have always argued that the meaning is abstract, intangible, ambiguous, and highly dependent on the listener. To be fair, Johnson acknowledges this but counters it by saying that he has found few who disagree with his interpretation. I did find myself powerfully drawn towards the stories of Shostakovich and the Russian people who performed and heard his works. It was also interesting to learn about policies that influenced cultural evolution, for example, Stalin’s directive that all creative works should meet the requirements of ‘Socialist Realism’. But what I found most compelling was the author’s own autobiography and the role that this music has played in enabling him to cope with serious episodes of depression and a deeply traumatic relationship with his mother. Referencing several well-known psychologists, Johnson elaborates on the broader implications, offering some interesting insights into how music can be used to open a dialogue or provide a new therapeutic perspective. While the narrative reads rather like a stream of consciousness at times (albeit one that is both informed and informative), I did find parts of it highly engaging and powerful. It has left me with a new desire to listen to Shostakovich’s music and to reflect on what might have been going on in his mind while he created those works. And most of all, it has reminded me of the capacity of music to speak to and comfort those in emotional distress.